"You take this game." "No, you." The New York Giants begged the Philadelphia Eagles to pull out an ugly road win at Metlife Stadium Sunday afternoon, but the Birds simply wouldn't have it. And so they drop to 4-4, and 0-3 in NFC East play. Two weeks ago, we gave Doug Pederson the "Big Balls Doug" Award, deservedly, for his aggressive move to go for two after the Vikings committed a penalty on a PAT. It is also noteworthy that Pederson was five for five on fourth down attempts heading into the Eagles' matchup with the Giants. For the most part, Pederson has been aggressive, and for the most part, his aggressiveness has paid off. And then last week against the Dallas Cowboys, Pederson took his foot off the gas a little in "tough decision" situations, most notably the decision not to call timeouts to force a Cowboys punt at the end of regulation. We temporarily took away his Big Balls Doug Award for those actions. Pederson even lamented those decisions last week. "Staying aggressive, I think that's something that that I've kind of prided myself on a little bit," said Pederson in his post-game press conference in Dallas. "Being smart with it though, at the same time." It seemed as though Pederson was going to "go for it" come hell or high water if he faced a tough decision against the Giants. And that he did. On a pair of fourth down situations early in the game when the Eagles were well within field goal range, Pederson went for it and lost. Many will take issue with those decisions, especially with the advantage of hindsight, knowing the Eagles lost by five. Poor Doug is sure to be embroiled* in controversy over those calls all week on Philly sports talk radio. • 2 presumed made field goals = 6 points. 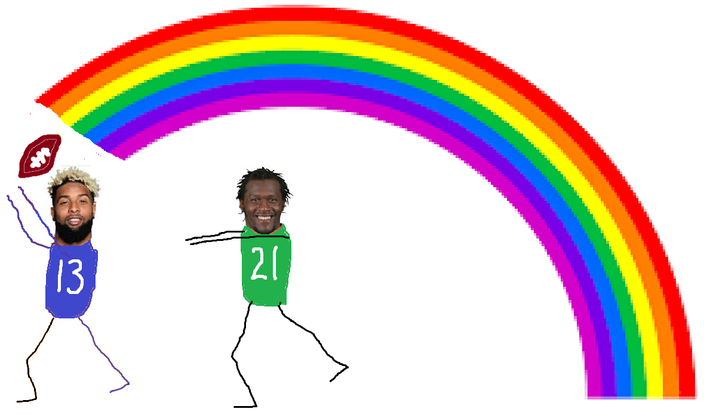 • 6 points + the Eagles' final score of 23 = 29. • 29 points is 1 point more than the Giants' final score of 28. So sure, by that highly flawed logic, Doug is terrible and should be waterboarded until he learns his lesson. Personally, I have no issue with the decisions to go for it in those situations. If you have a head coach with an aggressive mindset, you can't applaud the "five for five" on fourth down earlier in the season, and then turn right around and kill him when fourth down conversions fall short. However, when you've already tried a few quarterback runs that have gone nowhere, maybe that shouldn't be the play call in a crucial situation. Today, Pederson was aggressive, and his balls burst. It happens. Bryce Treggs has 69 yards already. Nelson Agholor has never had 69 or more yards in any game of his career. But also, can you imagine if Agholor was unable to recover his fumble in the fourth quarter, and that was what cost the Eagles the game? He'd have to move. DGB was targeted five times today. He had zero catches. Doug Pederson and a handsome reporter had the following exchange after the game. Handsome reporter: You had a number of plays where DGB was matched up against a corner that's like seven inches shorter than him, and for whatever reason you weren't able to hook up on those plays. Are you happy with the throws that Carson made on those situations, and are you happy with the way the receiver attacked the football? Doug: Where they complete or incomplete? Handsome reporter: They were all incomplete. Doug: Well then I'm not happy. OK, so that doesn't answer who is more responsible for the incompletions that went Green-Beckham's way, but have you ever seen a receiver as big as him be so passive attacking a ball in the air? Wentz threw two truly terrible interceptions to start the game. Let's not sugar-coat it. He simply misfired on throws he should have made, but they sailed on him into the waiting arms of Giants defenders. After his first four passes, Wentz was 2 for 4 with 10 yards and 2 INTs. The Giants scored 14 points off of those turnovers. After that, Wentz was 25 of 44 for 354 yards. Wentz is a rookie, in case anyone forgot, but he was unfazed by what can only be described as a disastrous start to the game. But, you know, the disastrous starts to games kinda need to stop. When Eli Manning threw an incomprehensible interception to Jordan Hicks, opening the door WIIIIIIDE open for the Eagles to score a game-winning touchdown, they were unable to get the job done. 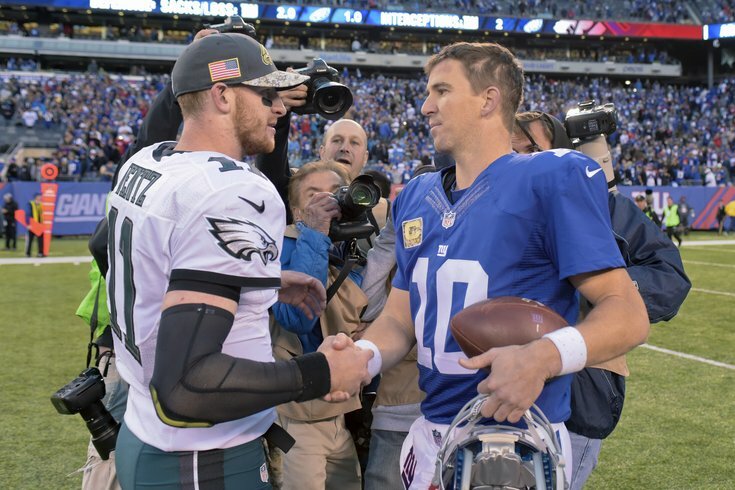 Wentz isn't fully to blame of course for the Eagles' failure to put the Giants away, but if you're an Eagles fan, it'd be a lot cooler if he did. Eagles fans should be celebrating their outstanding defensive playmaker Jordan Hicks today. But nope. The Giants have two offensive tackles who have struggled to pass protect all season long, and a guy with 17 career snaps filling in at LG after the Giants lost Justin Pugh for the game with a knee injury. They were ripe for the picking by the Eagles' defensive line ... and ... nothing. McKelvin is the 47th recipient of this award. Matt Ryan and Julio Jones are licking their chops. The Eagles are now essentially four games behind the Cowboys. They are simply not going to catch them.